Der Artikel Hallelujah: The Songs Of Leonard Cohen wurde in den Warenkorb gelegt. 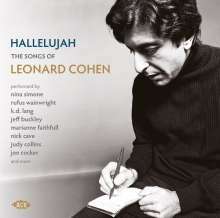 • This new release in Ace Records’ long-running and highly regarded Songwriters series comprises handpicked recordings of works by Canada’s much-missed poet laureate Leonard Cohen, including two songs the great man himself never recorded. • “I’ve never gotten over the pleasure of someone covering one of my songs. I don’t have a sense of proprietorship, which probably stems from coming up as a folksinger where it was understood that songs develop a patina through interpretation. I feel that’s the mark of excellence,” Cohen once said. • Here’s your chance to experience that excellence via 18 eclectic recordings of Cohen compositions by a diverse array of performers from a five-decade time span. ‘Hey, That’s No Way To Say Goodbye’ is heard in a 1967 version by folk queen Judy Collins, the first-ever artist to record a Cohen song, while Marissa Nadler’s spellbinding interpretation of ‘Famous Blue Raincoat’ dates from 2007. • The collection opens with the full-length album version of ‘Hallelujah’ by Jeff Buckley, one of the most sublime pieces of recorded music one could wish to hear, and closes with Cohen disciple Nick Cave’s radical reworking of ‘Avalanche’. Other highlights include k. d. lang’s reading of ‘Bird On A Wire’, Ron Sexsmith’s ‘Heart With No Companion’, Nina Simone’s personalised arrangement of ‘Suzanne’, and a live version of ‘Chelsea Hotel No. 2’ by Rufus Wainwright. • The accompanying 24-page booklet includes a Cohen biography by Ian Johnston and an in-depth track commentary by compiler Mick Patrick featuring illuminating quotes from Cohen on many of the songs.